This nursery is for my daughter, London. I was excited to learn I was having a girl and so was my husband. His only concern was if everything had to be pink. I said no, and so I found a way to have the primary color be aqua and accessories pink and grey. The fabric from Carousel Designs was the main inspiration. I loved the contemporary feel of pattern and the colors in it. 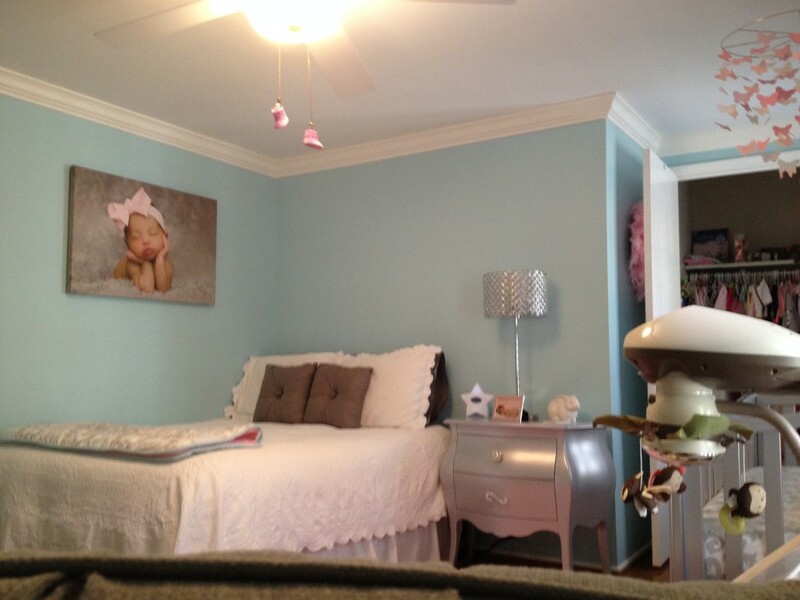 The grey, white, aqua, and pink were girly and modern, just like London will be. I definitely gravitate toward modern and glamourous elements. If it shines, it's mine! I love using color too. I have a strange habit of picking expensive items, but I find pieces that are affordable too. I fell in love with the the Alexa nursery furniture, which is from Natart. It's so different from most collections out there. The crib bedding, pillow, curtains, changing pad cover, and blanket is called Pink and Grey Rosa and is from Carousel Designs. It has calming colors and such a fun pattern on it. The glider is from Nursery Classics. The pink paper butterfly mobile is from Pottery Barn Kids. It was so sweet and delicate. There are booties hanging from the fan that came from my shower cake. I wrote the details of her birth on the bottoms of the shoes. I painted the artwork that hangs above the changing table- dots, dots, and more dots. My Mom gave me the hand print I made for her as a present when I was a little girl. When she is little older, I will add London's hand print below mine. One of London's newborn pictures is on stretched canvas. The picture is incredible and makes me smile each time I see it. The pink shaggy rug is from Buy Buy Baby. It feels so good on the tootsies! On the night stand is a bunny bank from Tiffany and Co. that my sister got London. My favorite items in the room include the blinged out Bible that my Mom gave London at one of my baby showers. It sits on the bedside table. I also love the serenity star from Aden and Anais, which I got from Buy Buy Baby. It is a night light that changes colors depending on the temperature of the room: red if too hot, blue if too cold, and white if just right. It also is a clock, feeding diary, and plays music! I love the My Lil SnugaMonkey Cradle 'n Swing from Fisher-Price. My daughter coos so much while she watched the monkeys circle above her head. What could be better than that!! I think decorating is something you do with patience and perseverance. Keep looking until you find the perfect pieces. When it comes to nurseries, the most important thing you can incorporate into the design is love! 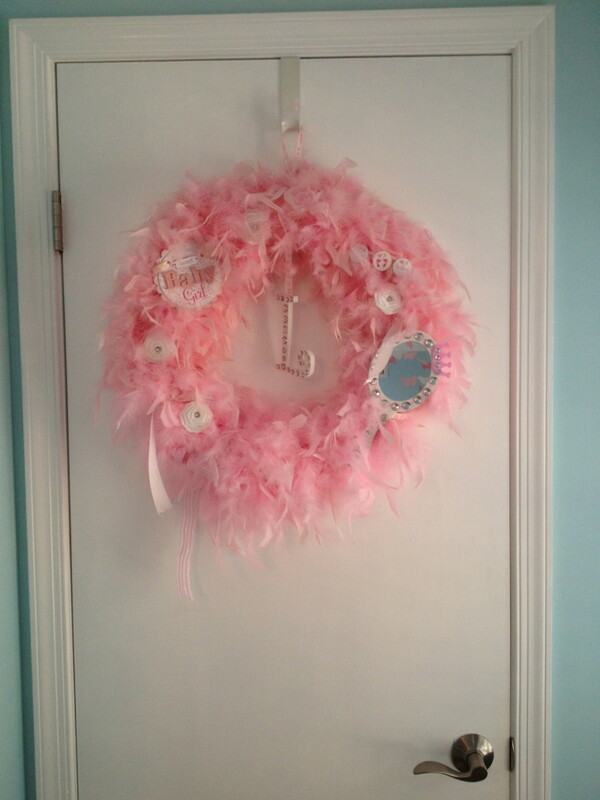 Make something that your child can keep that will be a reminder of how much you cared even before she was even born! what is he name of the paint color you used on your walls? What color paint? Behr ? Could you please share paint color you used on walls? I would be so grateful. Hello what is the name of the paint?